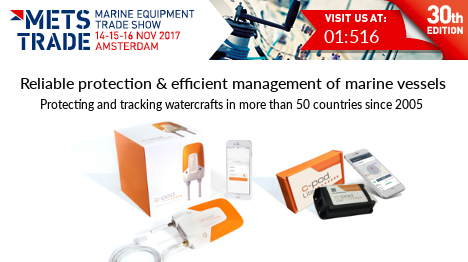 METS is the world’s largest trade exhibition of equipment, materials and systems for the international marine leisure industry organised by Amsterdam RAI in association with the International Council of Marine Industry Associations (ICOMIA). Meet us at the Grad Pavois boat show and find out what C-pod can offer! Watch our partners explain the benefits of working with us! Our team had a great week at the Cannes Yachting Festival! Watch some of our partners explain the benefits of working with us! https://www.c-pod.com/inc/uploads/2017/04/C-pod-logo-300x100.png 0 0 C-pod https://www.c-pod.com/inc/uploads/2017/04/C-pod-logo-300x100.png C-pod2018-09-18 09:38:002018-09-27 09:43:29Watch our partners explain the benefits of working with us! Lagoon has chosen C-pod as standard equipment in one of their new boat models. The boat manufacturer Lagoon has chosen C-pod as standard equipment in one of their new boat models. Lagoon manufactures large catamaran boats between 38-78 feet and is one of the world’s leading catamaran manufacturers and a part of the Benetau Group. https://www.c-pod.com/inc/uploads/2017/04/C-pod-logo-300x100.png 0 0 C-pod https://www.c-pod.com/inc/uploads/2017/04/C-pod-logo-300x100.png C-pod2018-04-06 14:48:362018-04-06 14:50:08Lagoon has chosen C-pod as standard equipment in one of their new boat models. You are welcome to come and meet us in stand: PADIGLIONE “E”, CORSIE 36, PARTICELLA 1166. Visitors entrance N 5,6 Via Maestri del Marmo the 5 – 7 of April. C Security Systems are happy to announce GIMIYACHT as the distributor for the C-Pod Security System in Czech Republic. C-pod is exhibited at the Helsinki boat show. You are welcome to come and meet us in booth 5n61, 9 – 18 of February. https://www.c-pod.com/inc/uploads/2017/04/C-pod-logo-300x100.png 0 0 C-pod https://www.c-pod.com/inc/uploads/2017/04/C-pod-logo-300x100.png C-pod2018-02-09 19:56:002018-02-11 19:59:23C-pod is exhibited at the Helsinki boat show. C Security Systems are happy to announce ProNav as the distributor for the C-Pod Security System in Finland. All C-pod products will be available.